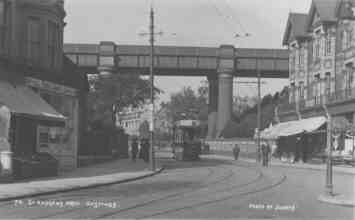 The Queens Road Railway Bridge was officially opened on the 8th November 1898. 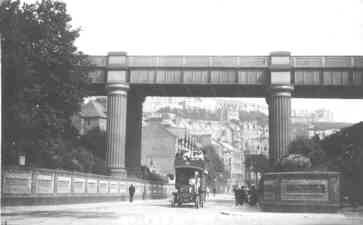 To mark its centenary Hastings Borough Council has comissioned a scheme to light up this fine gateway structure. The cost of the works has been jointly funded by the Council and Railtrack PLC, with an expected financial contribution from East Sussex County Council. 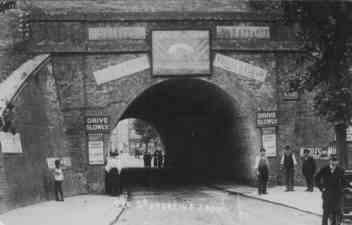 As part of our contribution to widening access to the history of the town of Hastings we are posting some historic pictures of the bridge and St.Andrews Arch which it replaced. We are indebted to David Padgham and Richard Pollard for the use of their pictures, Bob Hart for the brief history and to Ion Castro for the layout. 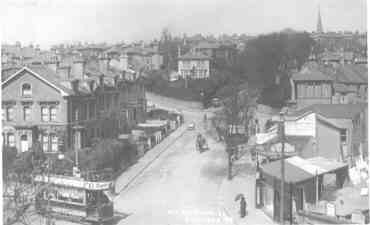 Its worth remembering that Grey Owl (Archie Belaney) lived round the corner in St.James' Road and would have seen the 'new' bridge being built, and later on Robert Tressell describes Barrington leaving in "The Ragged Trousered Philanthropists", and this is the bridge in the description, Tressell could see it from the window of his flat in Milward Road. Queens Road becomes St Helens Road once you pass under the bridge and beside Alexandra Park During Road resurfacing a complete run of tramlines was uncovered st in this road Click Here for more pictures. 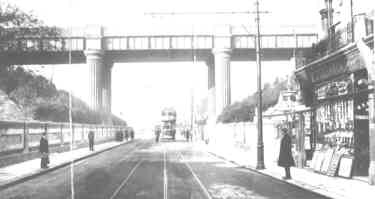 St. Andrews Viaduct or the Queens Road Bridge. 1846 June. Commencement of construction of a tunnel. 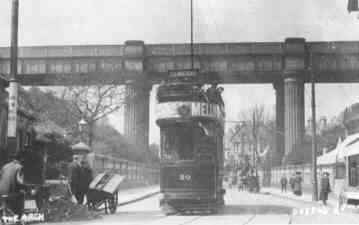 To be known as St. Andrews archway. 1849 September. Several cracks noticed in brickwork of the structure due to the weight of the embankment above. 1851 February 13. 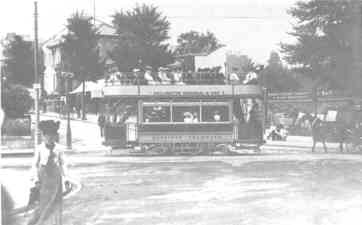 Opening of the Ashford to Hastings railway line. 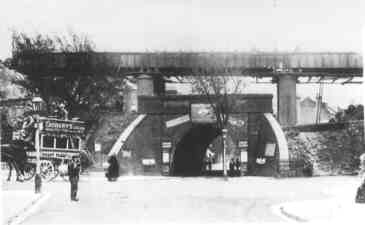 The new ornamental Arch would cost �35 or �00 in excess of the previous tender obtained by the railway company in 1890. After discussion it was agreed that the railway Co. would contribute 1/6 of the costs and agreed not to disfigure the new structure with advertisements. 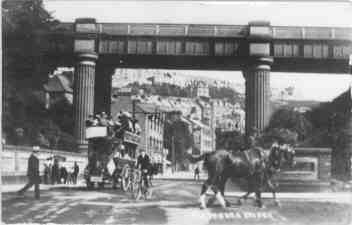 Eventually a motion to construct a Bridge/viaduct was passed 14 to 5. Two weeks later following a change of mind all the dissenters agreed to the motion except one. 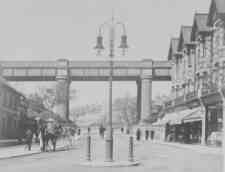 Alderman Tuppenny was the main promoter of a replacement of the St. Andrews tunnel/archway having championed it on all possible occasions. "It was considered particularly appropriate that he should become Mayor at a time when the works for nearly complete". It was described as"the most important work in beautyfying the town in many years". 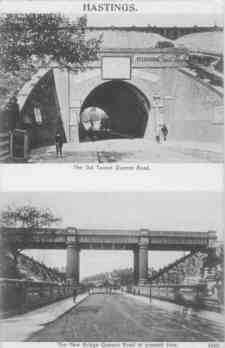 The width of the tunnel was only 19' 6" but the new structure created a road nearly 50' wide. 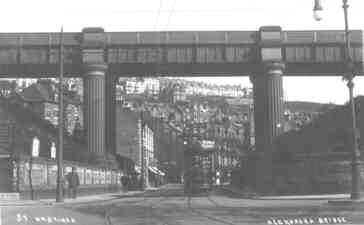 Originally the western footpath was designed to pass on the inside of the pillars as exists on the eastern carriageway. On Friday afternoon 4th November unaided by workmen a section of the roof at the northern end of the tunnel fell in. Traffic was stopped. Buses to Spa and Mount Pleasant suspended. 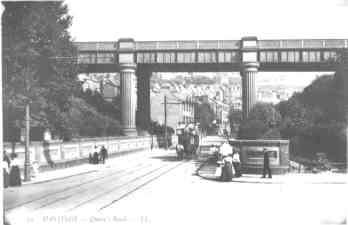 Demolition of the structure began on Saturday night 5th November 1898 and took three days, the demolition spoil was deposited on the railway embankment. 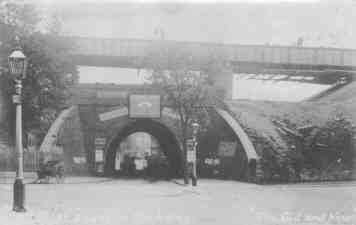 The new archway which had been erected above the tunnel although not fully completed was opened to pedestrians and vehicles on Tuesday 8th November 1898.